Since Talking Rock Golf Course opened in 2007, it has become a must-play. 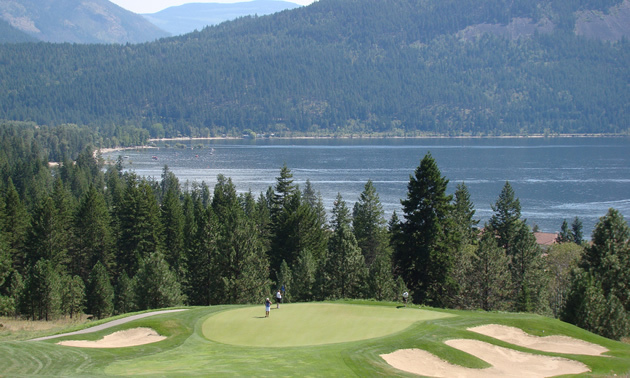 The course is located on Little Shuswap Lake near Chase, B.C., and is owned by the Little Shuswap First Nation. The name Talking Rock recognizes the Indian band’s ancestors, who recorded historical events on rocks with either pictographs or petroglyphs that still talk to present members. Canadian golf architects Graham Cook and Wayne Carlton have created a sensational masterpiece receiving outstanding reviews. The front nine wanders through the forest, with the fairways lined with mature pine trees. The fairways are more than generous, so “grip it and rip it.” Hole No. 7, a par 5 of 562 yards, is the signature hole. Watch for the bear which is carved into the fairway sand trap. Hole No. 9 is difficult. It’s a par 4 of 388 yards with water on the left and trees and sand traps within driver range. The back nine is a slow upward climb to the picturesque 14 and 15 holes. The last par 3 is No. 15, 210 yards downhill with Little Shuswap Lake in the background. Hole No. 16 is a long par 5 at 602 yards with a dogleg right. The four par 3 holes are probably the best set in the province. All the greens are large and undulating and guarded by plenty of sand traps. Each hole is unique and isolated from other holes.The 18th (par 4, 410 yards) runs parallel to the lake, with the beach and lake making one long hazard. Talking Rock is also a resort combined with the 70-room Quaaout Lodge. The lodge offers 2,400 feet of sandy beach, indoor pools, spa, meeting facilities, authentic native gourmet meals at Sam’s Restaurant and a native interpretive center. The golf course, however, remains the centre of attention.